Oh my, this is the last post for 2016! Because 16 makes a nice square graphic. haha. It’s (very) difficult to only pick 16. And yes, these are all color in The Laurel Home Essential Paint Color Collection (you can access the pages that will tell you all about it) which now comes with the Paint Palette Collection in one wonderful 500 page 2-part guide! There are 144 colors in all and they are all fabulous. Well, I think so! But here there are only 16. For some folks, even 144 is just too much choice. And this is my end of the year gift to y’all. I’m so grateful for this blog and your wonderful support! I guess anyone who’s been reading my blog for more than a week knows that I love Cotton Balls. This is a white that does what you tell it to do! It really does. But, please test it anyway. Darryl Carter (this is his gorgeous room) has a line of Benjamin Moore paint colors and Swiss Coffee is one of them only he calls it Hanover White. I don’t know for sure if the room above is Swiss Coffee/Hanover White or not. It doesn’t matter. It’s a lovely, warm, but not yellow white with the right amount of gray. It is also a superb color for the OUTSIDE of your home, if you’d like to paint it white. Sorry, I cheated. This cabinet is actually white dove. What’s the difference? Not a lot. Ivory White is just a little creamier, is all. Both are fabulous white colors for cabinetry, walls and trim. For the only six white paint colors I’ve ever used click here. is one of those colors that can look gold, khaki, or cream depending on the light. It’s a wonderful neutral and a great alternative to builder’s beige. A job we did recently. Classic Gray is a soft whisper of a warm gray that sometimes has a very slight lavender undertone which is very appealing. This is one of my all-time go-to colors. It’s another fantastic neutral. Not too pale, but not dark. It can go anywhere. Kingsport Gray is the quintessential putty or drabware color. It always makes me think of Martha Stewart. 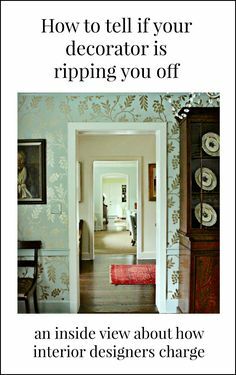 It’s a classic and looks fabulous in older homes especially. 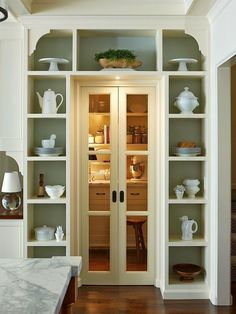 This is a good one for painted brick, cabinetry and libraries too! This is in the top three. I’ve specified it more than any other color– especially for master bedrooms. It’s a color that everyone loves! It’s just the perfect blend of gray, blue and green. I included one of the my boards from the Paint Palette and Home Furnishings Collection. Cleveland green is a color that I found out about through Bunny Williams. It’s deep and rich. Not brown, not green really, but a blend of the two. Abalone is another fabulous color. It’s a warm gray, but with a healthy dose of brown and a touch of lavender. It looks fabulous in either dark or bright rooms, but I love it especially in a darker room. The lavender will come out a little more, but it’s really lovely and not at all PURPLE! Van Deusen blue is another of Benjamin Moore’s historical colors. It’s a rich, dark blue with just the right amount of gray and a touch of green, so that it is never cold feeling. In a darker room it will go almost navy, but will look lighter in a brighter room. This is a color that I first saw last spring at the High Point Market at the Dunes and Duchess booth. Hands down, the best navy I’ve ever seen. Of course, I was seeing it in artificial light, but it held it’s own and looked amazing as a backdrop to their colorful art and their line of home accents. My kitchen. This is a wonderful chartreuse and a great choice for someone wanting to try out a yellow green for the first time. This color does need windows and doors, cabinets and art to break it up, but it’s a wonderful back-drop and a color that is truly universal. This was another booth at the High Point Market in the antique section. The guy gave me the name of another color, but when I got home it did not look at all like the color, so I went with Racing Orange. It’s not really orange and not really red, but right in between. It looks absolutely wonderful with antiques and gold as you can see. Well, I think so! And sorry. I forgot SHORELINE! Well, a little sliver and then a lot of reflection. This is my teeny tiny bathroom! Shoreline is the most soothing, soft gray. It is both cool and warm, with the tiniest whisper of blue-green just enough to keep it from looking dead. But it definitely not blue or green! I’m sure that I’ve left out some wonderful colors. Do you have a favorite that I missed? Please have a safe and joyous New Year’s Eve and I’ll see you in 2017! Thanks for this helpful post! 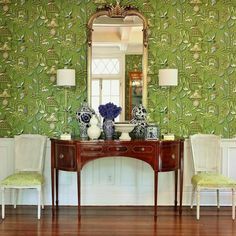 Can you tell me the name of the wallpaper in the Ivory White photo? Don’t bonk me on the head as this is not about paint directly. My question/comment is about the faucet in your Shoreline paint color photo of your tiny bathroom. Is that a Kohler Purist faucet? If so, do you love it? I am considering that faucet for my dual sink vanity (Carrara marble top on black). I’m thinking the chrome (least pricey of all the options) but the gold would be showy. Any great wisdom to share on faucet choices? I’d love to stay under $200 per faucet since I have to buy 2 and will also need to coordinate the tub/shower. I wouldn’t bonk you over the head for that! You’ve helped us so much through several projects. Your Rolodex and palettes have been heaven sent! Our latest project is a living room with fireplace that opens into the kitchen. We are going with Quiet Moments for the wall color in living room. We wanted to try (for the first time) to go with some color on the ceiling!. Ceiling is 9′. Room receives moderate light through the day. Question: Would it be ok to carry QM onto the ceiling as well, go 50%, or drop down one shade to Healing Aloe. I know you can’t see the room, but just looking for a general principle. After all it’s bc of you we have the courage! Frustration abounds. I’m not there! Is there a crown? Is it one big room or is there a separation between rooms? But your three options are all good, so why don’t you make samples of all of them and get on a ladder (carefully) and place them one at a time flat on the ceiling in at least two spots. One, in a bright place and one in a dark place which is usually a corner. Thanks for the reply. No crown, and it is sorta one room, but walls cut in a bit as you enter kitchen side to define the spaces. We will take your advice on trying different samples. Do you generally recommend painting fireplace mantel the same white as the trim? Hi Laurel and Happy Monday! I have both your Essential Paint Color Collection and Ultimate Paint Palette and Home Furnishings Collection. You note Van Deusen Blue as one of your favorites in this post, but I only see it used in one Paint Palette in the Home Furnishings collection. I see more pallets containing other deep blues, such as Champion Cobalt, Deep Royal, Gentleman’s Gray, etc. and am wondering why. Is there a difference in the undertones? I am very attracted to Van Deusen, but am struggling here on the coast of the Pacific Northwest with dark rooms, light rooms and many that face north. All these blues seem wonderful for a library or a cabinet island. Would LOVE a post focusing a bit on Pacific Northwest light/color maybe with a coastal vibe. No particular reason. Gentleman’s gray is similar. And a few of those are interchangeable, in any case. Please take a look at this post. It’s on the Pacific northwest. Question: I love Quiet Moments; have you used it for a ceiling in projects? If not, can you recommend several light blues similar to Quiet Moments for ceilings? Finally for trims and doors would you use BM Advance in semi-gloss or use their standard line? These two posts might be helpful. The trim, usually regular semi-gloss. Used to always specify oil. Advance, I recommend only on new wood and with a painter who knows how to work with it. Yes, I’ve used both colors. Beach Glass is a little lighter, but also lovely. In fact, I used it in this job. Hi again, was just looking at these again and realized they’re very similar (at least on my phone’s screen) to the Benjamin Moore colors we used in our house: Tundra, Bunny Gray, Stonington, Apparition, Collingswood, and Nantucket Fog. And some of those might be the same colors! It is known that Benjamin Moore has some repeats due to the many iterations of their collection, in part. For instance Ivory White is the same formula as Acadia White. Hi Laurel — love this post as I am about to paint my entire downstairs…and absolutely adore the blue/orangey-red combo. Ahhh So many of my current favorites! Its like a Holiday presents to your followers – and i hadnt thought about racing — hmmm something to consider. Mascarpone is another good one. There are so many! But yes, it has a little less gray and a little more yellow, but it sounds like that’s what’s needed to counter-act the dark/northern exposure. And it’s also a testament why it’s so important to test! I’ve been to South Africa! Beautiful country! That’s a good question. I did just quickly look to see if there is such a thing. But here’s the thing. There are the formulas and then there are the bases that the pigments go into. So, even with the formula, if the base is different, then the color will be different. One thing you could do is acquire the fan decks. Then, you could try to match them up with your local paint companies. Or maybe the companies can make Benjamin Moore colors. For instance, Sherwin Williams, BM’s biggest competitor here (I think) can make up the BM colors. 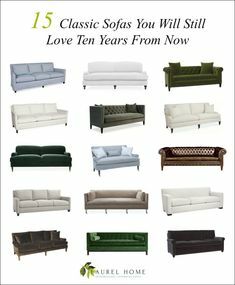 Not just for your favorite 16 colors, but for your fabulous blog. I am always hapoy to see an email from you, always learn something and ALWAYS have a good laugh. Wish you a very happy, prosperous and healthy new year! Your posts about paint are always so helpful, especially your explanation of underlying tones. 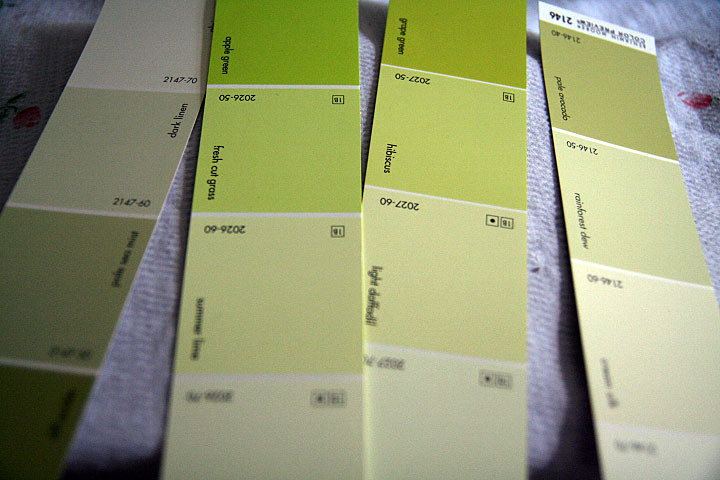 Pale Avocado is upper right corner and the current room color is a very safe, boring sage…very similar to color directly diagonal lower left. The room is very bright and I think the Pale Avocado will bump the room to the next level…of course,, at night all this fades off to darkness but morning is so cheerful in that room. A great way to start the day! Thanks again for your blog and insights. Enjoy this holiday season Merry Christmas Happy New Year. Rain Forest Dew below it is also nice, but better for a darker room. It will go more yellow in a brighter room. Best for the New Year for you as well Shirley! It’s a color that needs art and breaks, I think. I think it could look good in a small bathroom with lots of white. And also some black and gold accents like in picture frames. Love your paint posts. I’ve always loved white, when I was 15 I had white carpet installed in my bedroom, all white linens, etc. My single-girl apt in NYC was painted all white.. white couches.. ETC! However when I moved into my house 3 yrs ago, 9 months pregnant, forced to pick paint colors a week before moving in… I wanted all-white but SOMEHOW was convinced by MIL (grrr) to borrow someone else’s paint colors… they’re not bad but I’m so over them: Apparition and Collingswood. I did pick Chantily Lace as my trim color and every time I notice it I’m so pleased. We are seriously considering an expansion/addition to the house (larger family room, + mudroom+ office+ pool bathroom+ upstairs bonus room) in which I will absolutely use cotton balls (or one of the fave whites). 1) Your ‘favorite”pretty’ color picked randomly in a fan deck doesn’t necessarily translate to the most flattering/interesting/coordinated wall color; that’s how toddlers pick bedroom colors, not how designers put rooms together. 2) These are Laurel’s personal favorites based on her design experience – she isn’t saying they must be your top 16. Are you really so miffed that out of tens of thousands of paint colors she didn’t pick the same ones as you? Hahaha, this is a funny comment and just cracked me up. I actually had to splurt our a honking laugh when I read it. I’m sure hope this person does not work for a diplomatic corps! WWIII anyone? Yes, Michael is the proverbial troll. I usually don’t post these, but once in a while I do. But then I remember what others have said. Mean people are not happy people and their words are about themselves, not me. Please notice that troll did not offer any suggestions for what he perceives as beautiful colors.